NUSA DUA, Indonesia (Reuters) - Jack Ma, executive chairman of China's Alibaba Group Holding, said on Saturday he is discussing with Indonesia's government the possibility of opening an institute to train tech entrepreneurs in the Southeast Asian country. 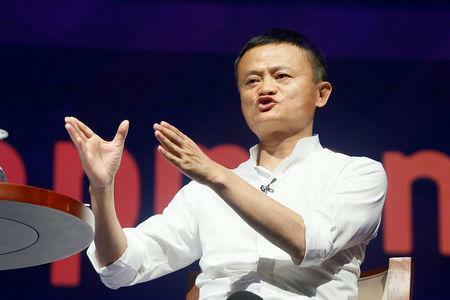 The co-founder of Alibaba, China's biggest e-commerce firm, said it is important for Indonesia to invest in human capital because "only when people improve, when people's minds change, when people's skills improve, then we can enter the digital period". Ma said his company would continue to invest "not only on e-commerce, but also cloud computing, logistics and...infrastructure" in Indonesia, while also helping local businesses to grow. Indonesian Communications Minister Rudiantara told Reuters in September that Indonesia was partnering with Ma to look into ways to harness Alibaba's businesses to increase its exports, particularly to China. McKinsey estimated in a report released on Aug. 30 that the value of Indonesia's e-commerce market will surge to at least $55 billion (£42 billion) by 2022 from $8 billion in 2017. On Friday, Ma told a panel discussion at the IMF and World Bank meetings that "the internet is designed for developing countries", with "great opportunities in Africa" also.